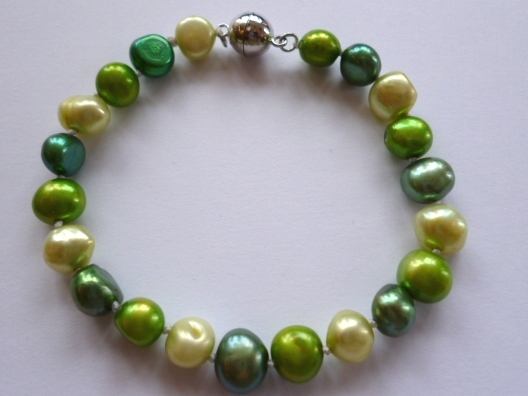 A great value 8 inch Baroque* pearl bracelet that's fun and stylish. This one is in a range of cool and vibrant greens from a palette of our fresh colours! Baroque* pearls are great fun and great value. Although we choose these high quality cultured fresh-water pearls for compatibility of shape and texture, each one is different! Being naturally irregular and asymmetrical, they bring style and interest to a simple design. Choose your clasp preference from the options listed. You can have a traditional 'lobster claw' or a 'no-fiddle' magnetic fastener. Your bracelet comes in a pretty and practical purse or a handsome gift box.